Mustard has been used for thousands of years to add flavour to food. The Romans introduced the seed to western Europe through Gaul, and records show that Parisian street vendors were selling small jars of the condiment in the 13th century. 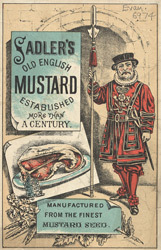 Mustard can also be used as a preservative, but by the 19th century it too often had a rather more unsavoury usage - to disguise the taste of meat that was no longer fresh. The English first mustard factory was opened in London in 1742 by Messers Keen and Sons at Garlick Hill.